Dental bridges fill the gap that is created by missing teeth, and consist of two crowns that are placed on the teeth that are located on either side of the gap, with a false tooth or teeth in between. Bridges are supported by natural teeth or implants. Extremely durable, porcelain fixed bridges are tooth-colored and, therefore, look very natural and can be an effective way to cosmetically enhance your smile. Please take a moment to read the following information about dental bridges, then call or email us to schedule an appointment with Dr. Larry Picard, DDS, one of West Los Angeles’ leading dental professionals. There are many types of dental bridges. You and your dentist will asses your dental issues and current oral health to find the best option for you. The “traditional bridge” is the typically the popular type of bridge, and is commonly made of porcelain that is fused to metal. Porcelain fixed bridges are a top choice because they closely resemble your natural teeth. 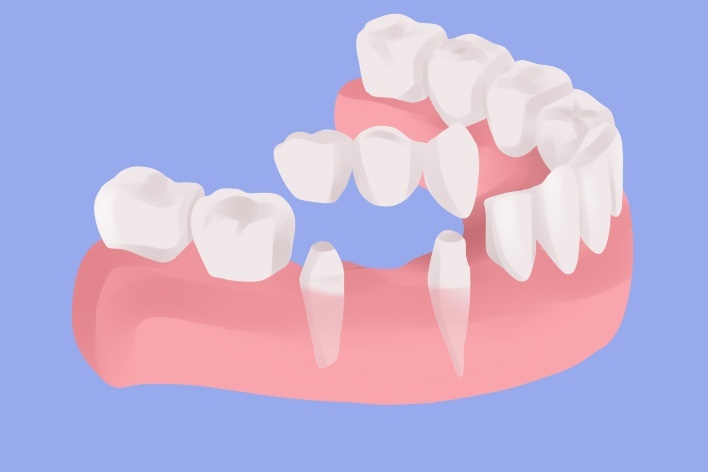 This type of bridge consists of two crowns that expand over two anchoring teeth (or abutment teeth) and are attached to pontics (or artificial teeth), which fills the space that is created by one or more missing teeth. Bridges are extremely durable and will usually last many years. However, dental bridges may need to be replaced or re-cemented if worn down over time. *Fills gaps when teeth are missing. *Helps to maintain natural facial shape. *Prevents remaining teeth from gradually shifting out of position. *Restores chewing and speaking ability. *Gives you a brilliant, healthy smile. *Allows you to upgrade from a removable partial denture to a permanent dental appliance. 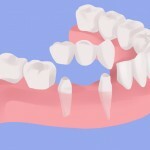 How are dental bridges put into place? The dentist will examine the teeth surrounding the gap to ensure that they are strong and healthy before your new bridge can be put into place. If he should find that there is a pre-existing dental issue, he will apply a build up agent to support the tooth. He will then shape the teeth onto which the bridge will be placed, before making a mold of your teeth. This mold is sent away to a lab, where your custom bridges will be created. Approximately 2 to 3 weeks later, a follow up appointment will be scheduled with the dentist to fit your new bridge, and to ensure that it is comfortable. If you are happy with the look and feel of your new bridge, then the dentist will finalize the process by cementing the bridge into place. When you lose a tooth, or even several teeth, the teeth which are remaining are negatively affected. These teeth will gradually shift, and can eventually even be moved out of their original sockets in order to fill the empty space. This can lead to such issues as an incorrect bite, compromised ability to chew while eating, and wrinkles and fine lines due to an alteration of facial features. Dental bridges fill the gap that the missing tooth has left, and help to remedy all of the issues mentioned above. Is a Dental Bridge the ideal solution for me? Ideal candidates for dental bridges are patients who have one or more missing teeth that are surrounded on both sides by healthy, structurally sound teeth. In addition, if the teeth that are surrounding the missing teeth are damaged, but treatable, then you are also a good candidate for bridges. Patients who are not ideal candidates for dental bridges are: young children who have not yet grown their permanent teeth and patients who are missing several teeth that are surrounded by teeth that are either decaying or not structurally sound. If your smile and dental health can benefit from dental bridges, call 310-479-4500 or email our Los Angeles dental office to schedule your first appointment with Dr. Larry Picard DDS. He and his friendly, knowledgeable staff can help you to get that brilliant white smile you deserve.